Sometimes a diagram is helpful to organize your thoughts. A little while ago I commented that crime rates had fallen through the floor even though single parenthood is still on the rise, apparently contradicting a generation of conservative conventional wisdom that attributed rising crime rates to the decline of the nuclear family. In the graphs I showed a very strong positive relationship between crime and single parenthood from 1960 until 1991, after which the relationship was reversed. Your graphs on single-mother families and crime rates, and your accompanying commentary, conveniently miss any reference to the massive increase in incarceration since the 1980s … Were it not for the fact that this country has incarcerated more than a million men behind bars since the late 1980s, it is likely that the upward swing in single-motherhood & nonmarital childbearing would have been paralleled by an upward swing in crime. I have written before about the family consequences of the drug war, focusing on how incarceration affects families, rather than on how (whether) family structure drives crime; as well as other aspects of the prison boom (such as giving birth in chains, distorted marriage markets, and how prisons contribute to the spread of HIV). But I didn’t address the question of how incarceration may have saved us from a worsening crime wave driven by single parenting. Unlike my random scattering, this uses the location of the nodes to simply convey the conceptual hierarchy — religion and capitalism as macro, values and behavior as micro, with each path a potentially observable process. The diagram also is intuitive because it shows time moving from left to right. And it’s simple — any less to it and there’s no need for a figure. 1. Demuth, S. and S. L. Brown. 2004. “Family structure, family processes, and adolescent delinquency: The significance of parental absence versus parental gender.” Journal of Research in Crime and Delinquency 41(1):58-81. Schroeder, Ryan D., Aurea K. Osgood and Michael J. Oghia. 2010. “Family Transitions and Juvenile Delinquency.” Sociological Inquiry 80(4):579-604. 2. Charles, Kerwin K. and Ming C. Luoh. 2010. “Male Incarceration, the Marriage Market, and Female Outcomes.” Review of Economics and Statistics 92(3):614-627. 3. Childs, E. C. 2005. “Looking behind the stereotypes of the ‘angry black woman’ an exploration of black women’s responses to interracial relationships.” Gender & Society 19(4):544-561. Robnett, Belinda and Cynthia Feliciano. 2011. “Patterns of Racial-Ethnic Exclusion by Internet Daters.” Social Forces 89(3):807-828. 4. Dixon, T. L. and D. Linz. 2000. “Overrepresentation and underrepresentation of African Americans and Latinos as lawbreakers on television news.” Journal of Communication 50(2):131-154. 5. Dixon, T. L. and K. B. Maddox. 2005. “Skin tone, crime news, and social reality judgments: Priming the stereotype of the dark and dangerous black criminal.” Journal of Applied Social Psychology 35(8):1555-1570. Dixon, Travis L. 2008. “Network news and racial beliefs: Exploring the connection between national television news exposure and stereotypical perceptions of African Americans.” Journal of Communication 58(2):321-337. 6. Tonry, Michael. 2010. “The Social, Psychological, and Political Causes of Racial Disparities in the American Criminal Justice System.” Crime and Justice: A Review of Research, Vol 39 39:273-312. 7. Pettit, Becky and Bruce Western. 2004. “Mass imprisonment and the life course: Race and class inequality in US incarceration.” American Sociological Review 69(2):151-169. Reiman, Jeffrey. 2007. The rich get richer and the poor get prison: ideology, class, and criminal justice. Boston: Pearson/Allyn & Bacon. Wakefield, Sara and Christopher Uggen. 2010. “Incarceration and Stratification.” Annual Review of Sociology 36:687-406. 8. I made this argument in a recent blog post here. For a more thorough review of media depictions of single parents, see: Usdansky Margaret L. 2009. “A Weak Embrace: Popular and Scholarly Depictions of Single-Parent Families, 1900-1998.” Journal of Marriage And Family 71(2):209-225. 9. On conservative foundation support for traditional-family-is-good research, see a few of my posts here, here, here, and here. 10. Nagin Daniel S., Francis T. Cullen and Cheryl Lero Jonson. 2009. “Imprisonment and Reoffending.” Crime and Justice: A Review of Research 38:115-200. Nice graph. Better to put numbers on the arrows because in some cases the text is pretty far removed from the relevant graph. This is great — it’s a nice example of the utility of causal diagrams for thinking through conceputal problems. 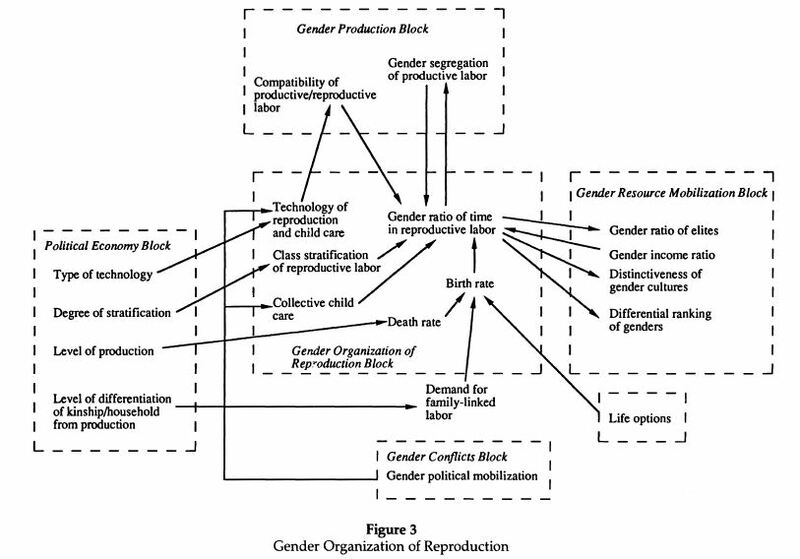 I may point my students to it next fall when my methods class hits the causal diagrams section. Of course the really complex part of the Collins et al. diagram is that it’s only one of six such diagrams in the article. I don’t get this from your diagram. Can you unpack? (No, I’m not trying to be snarky. It’s just that “more” to me implies a quantity, and there’s no “more” or “less” in the graph, just an indirect path from single parents to crime (via children’s environment). Good point. Plus, why are those two things compared like that when they’re not mutually exclusive? And the evidence I used to draw that conclusion is not all on the graph. 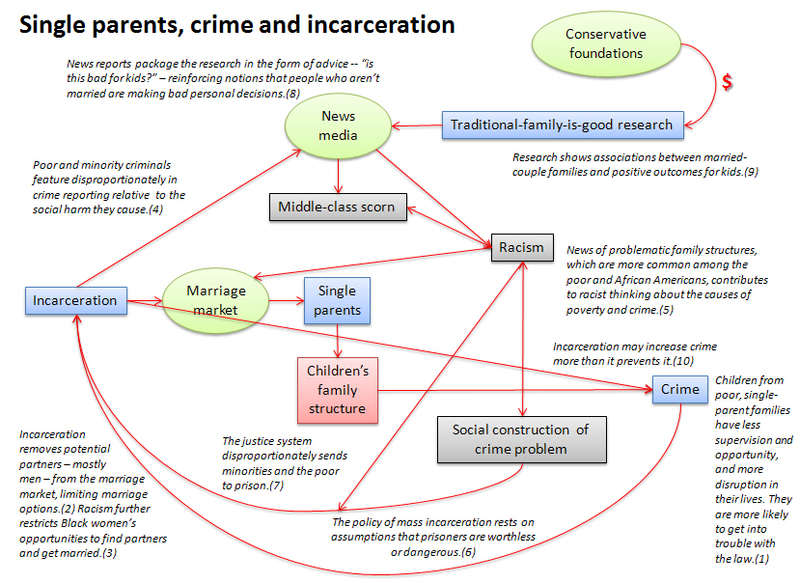 Still, there is lots of evidence for incarceration effects on family structure, so I’m confident about that. But the single-parent effect on crime is not clear at all. Note 1 and other sources offer some evidence for a direct effect, that is, children of single parents being more likely to commit some crimes. But I don’t see evidence it’s a major cause of crime compared with other things, partly because of the dramatic reversal of the relationship in recent decades — that’s hard to square — and partly because of the contextual factors that probably moderate those effects (such as schools, neighborhoods, peers, poverty, etc. ).